The demonstration against President-Elect Donald Trump has gathered for yet another night in the Pacific Northwest city. The demonstration heavily interrupted traffic in the city as protesters moved across other major roadways, local media reported. “Crowd throwing projectiles at police. Significant damage to area car lot,” police said. Portland activist Greg McKelvey said Thursday that several human rights groups in the city would be working together under the new name, Portland’s Resistance. “In order to survive President Trump there needs to be a strong resistance. Our group believes that Portland has an opportunity to become a beacon of light for the rest of the nation,” McKelvey wrote in a press release on Facebook. The group has scooped over 3,000 likes so far. “After several orders to disperse, police have used less lethal munitions to effect arrests and move the crowd. Officers still taking projectiles,” police tweeted. Thousands of people have been out in the streets across the US, since Trump won the 2016 presidential race with 290 electoral votes November 8, leaving Hillary Clinton officially behind, although she won the popular vote. 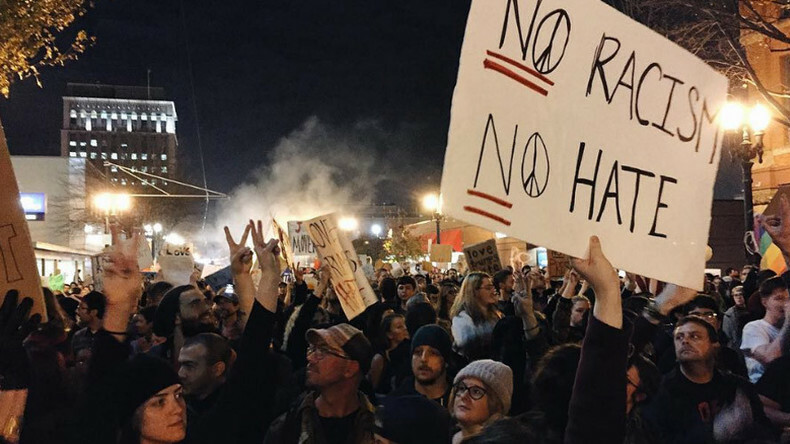 Chanting anti-Trump slogans, such as “not my president” or “we reject president-elect,” people have been occupying streets in cities from California to New York, expressing their displeasure at the presidential race’s outcome. Following demonstrations, Trump took to Twitter on Thursday, lashing out at “professional” protesters, who have been rallying against his election since Wednesday. “Just had a very open and successful presidential election. Now professional protesters, incited by the media, are protesting. Very unfair!” Trump wrote in a tweet.